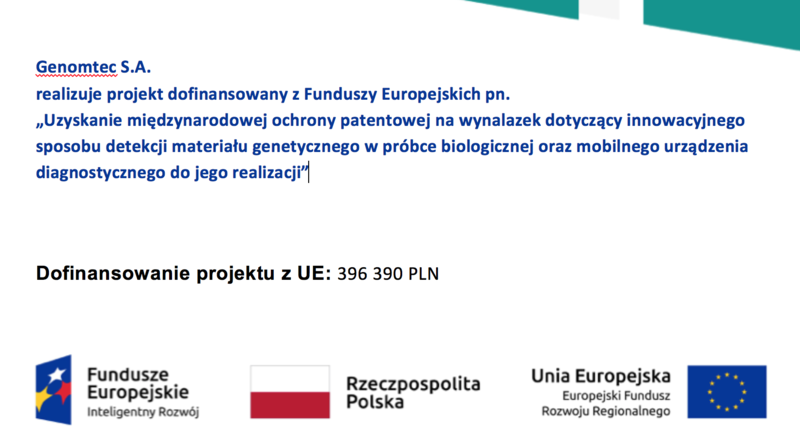 Project entitled “Obtaining international patent protection for an invention concerning an innovative method of detecting genetic material in a biological sample and a device for its implementation” was co-financed from European Funds. Its aim is to obtain patent protection for the invention regarding an innovative method of detecting genetic material in a biological sample and a device for its implementation used for the diagnosis of bacterial, viral, fungal infections and the detection of genetic mutations. Genomtec in the framework of the project will make 4 patent applications: in the European procedure, in the PCT international procedure, including the application in Japan, Brazil, China and the application in the domestic procedure on the US and Canada market. Co-financing under sub-measure 2.3.4 Protection of Industrial Property of the Intelligent Development Operational Program, 2014-2020 co-financed by the European Regional Development Fund.